Like the ping utility, traceroute is implemented using ICMP messages. However, unlike ping, traceroute was originally not designed to use a special ICMP message type intended exclusively for route tracing. Instead, it makes clever use of the IP and ICMP features that are designed to prevent routing problems. Recall that the IP datagram format includes a Time To Live (TTL) field. This field is set to the maximum number of times that a datagram may be forwarded before it must be discarded; it exists to prevent datagrams from circling an internetwork endlessly. If a datagram must be discarded due to expiration of the TTL field, the device that discards it is supposed to send back to the device that send that datagram an ICMP Time Exceeded message. This is explained in much more detail in the topic that describes that message. Under normal circumstances, this only occurs when there is a problem, such as a router loop or other misconfiguration issue. What traceroute does is to force each router in a route to report back to it by intentionally setting the TTL value in test datagrams to a value too low to allow them to reach their destination. The traceroute utility sends a dummy UDP message (sometimes called a probe) to a port number that is intentionally selected to be invalid. The TTL field of the IP datagram is set to 1. When R1 receives the message, it decrements the field, which will make its value 0. That router discards the probe and sends an ICMP Time Exceeded message back to device A. Device A then sends a second UDP message with the TTL field set to 2. This time, R1 reduces the TTL value to 1 and sends it to R2, which reduces the TTL field to 0 and sends a Time Exceeded message back to A. Device A sends a third UDP message, with the TTL field set to 3. This time, the message will pass through both routers and be received by device B. However, since the port number was invalid, the message is rejected by device B, which sends back a Destination Unreachable message to device A. This process is illustrated in Figure 321. Amusingly, we see that A sends out three messages to B, and gets back three error messages, and is happy about it! J The route to device B is thus indicated by the identities of the devices sending back the error messages, in sequence. By keeping track of the time between when it sent each UDP message and received back the corresponding error message, the traceroute utility can also display how long it took to communicate with each device. In practice, usually three dummy messages are sent with each TTL value, so their transit times can be averaged by the user if desired. The traceroute utility identifies the devices in a route by forcing them to report back failures to route datagrams with parameters intentionally set to invalid values. The first message sent by device A here has a Time To Live (TTL) value of 1, which will cause R1 it to drop it and send an ICMP Time Exceeded message back to A. The second one has a TTL value of 2, so it will be dropped and reported by R2. 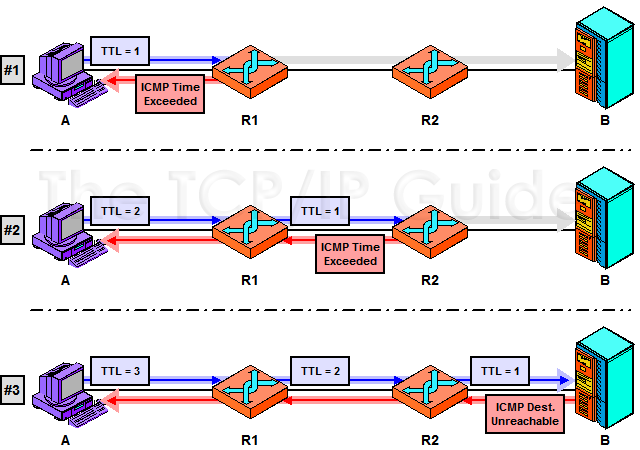 The third will pass both routers and get to the destination host, B, but since the message is deliberately chosen with a bogus port number, this will cause an ICMP Destination Unreachable to be returned. These error messages identify the sequence of devices in the route between devices A and B. Key Concept: The traceroute utility takes the idea behind ping one step further, allowing not only communication between two devices to be checked, but also letting an administrator see a list of all the intermediate devices between the pair. It works by having the initiating host send a series of test datagrams with TTL values that cause each to expire sequentially at each device on the route. The traceroute program also shows how much time it takes to communicate with each device between the sending host and a destination device.